Earlier this week Viacom president Philippe Dauman announced The Beatles: Rock Band has been seeing better than expected sales. However, according to Former Yahoo COO Dan Rosensweig who took over the GH franchise last March, Guitar Hero 5's retail performance hasn't been affected one bit by The Beatles: Rock Band, and that The Beatles Rock Band is being outsold by Guitar Hero 5. 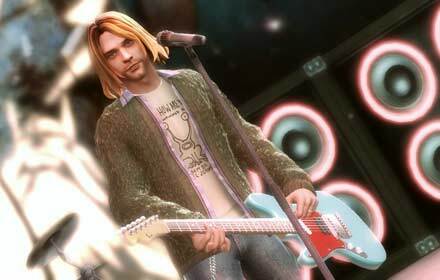 Apparently the controversy surrounding Guitar Hero 5 for it's use of late Nirvana singer Kurt Cobain has not affected the game in terms of retail. Both GH 5 and The Beatles: Rock Band have received praise from critics and fans alike, but the latter has been seeing better sales figures, possibly because of it's wider appeal. Rosenswieg claims that Guitar Hero 5 has been outselling The Beatles: Rock Band 4-to-1 in the US alone. He also told the British buisiness daily that in other retailers the ratio was 9-to-1 in favor of Guitar Hero 5 which will allow gamers to get Guitar Hero: Van Halen for free this December, looks like GH fans will have a happy holiday. It looks like plastic instruments are here to stay.